There are some golden rules to follow when facilitating an event which I will cover in this section. The aim of the facilitator is to create a safe learning environment where trainees feel they can share ideas and experiences. There ought to be an ethos of “there’s no such thing as a silly question” where people feel comfortable and free to express themselves. There will be different levels of skills and experience in the room and people will be feeling different levels of anxiety and even fear about their role in the group and what they can contribute. If someone says something that is wrong or goes against what you are trying to achieve it’s very important not to expose the contribution as wrong in front of the whole group. This will only close that person down and their learning will be affected by the experience. I would always open the comment up to the rest of the group to explore further by saying, “what do other people think about that?” The group will then challenge the comment respectfully or a discussion can be started if other people share the same view. If you still have concerns about a particular point of view or comment this can be challenged later. When working in smaller groups trainees also need to feel like their contributions are valued and that they can share their experiences. Trainers need to remember never to say a contribution is wrong, always open it up to the rest of the group during feedback if necessary. 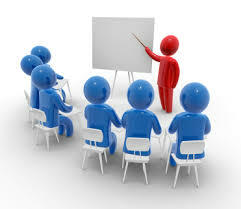 When facilitating a discussion always be led by the group and use open questions. It’s helpful to open the discussion by asking, “How did people find that?” or “what was the point of the exercise, what were we trying to demonstrate?” You can then be led by how they respond and ask follow up questions accordingly. When giving feedback remember the “rubbish sandwich” where any development points are sandwiched between praise. Always end on a positive note even if there doesn’t seem to be anything to praise. You can always make a comment about their style or body language or even their tone or voice. When recapping the day, either at the end or the beginning of the following day it’s important to have your notes in front of you so you can make sure everything is covered. This is a very important part of training as it consolidates learning and helps trainers assess how much the group has remembered. Ask open questions to aid the discussion such as “What do people remember about that?” and “what surprised you or what stood out about the exercise” This will make sure that main points you want people to remember are more likely to sink in. Making sure you get a balanced contribution from everyone can be challenging! Some people will want to talk a lot and will embellish points with life experience. This is difficult; much of what they say may be valuable and relevant but beware of allowing them to dominate discussions. Quieter group members will often be quite happy to sit back and allow this to happen so work together with your co-trainer to close these people down and draw out other members. 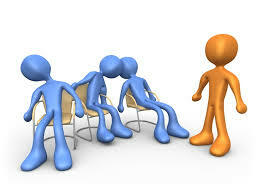 An effective way to do this is direct questions to quieter group members, being careful not to sound aggressive. “Laura, what do you think?” for example, is a gentle way of drawing out an opinion without exposing her too much. Saying, “Laura, you haven’t said a word all day, what do you think” is more likely to close her down for the rest of the course, for example. Never, ever disagree with or contradict your co-trainer in front of the group. Doing this is not only unprofessional and unsupportive, it also gives a very clear message to the group that you don’t know what you’re doing and will not instil confidence in you. If your co-trainer says something you don’t agree with wait till the break, bring it up with your co-trainer and let him/her correct their own mistake to the group. If energy levels are getting low and people are showing signs of not paying attention, get them on their feet and moving around. Asking people to work with people they haven’t worked with before and splitting up the groups is a good way of injecting energy. Always try and use open questions when eliciting points from the group rather than telling them the answers. “Why are boundaries so important” will be remembered much more than “boundaries are important because …” as the group will “buy into” the reasons more than when they feel lectured. Use follow up questions to reinforce your points such as, “what personal boundaries would you put in place?” or “who’s at risk if we’re not strict about boundaries” This will allow you to develop your point and the group will feel like they are coming up with answers themselves. Use reflecting and summarising techniques wherever possible when people are giving examples and answering questions. This not only demonstrates active listening skills but also buys you a few moments to think about what to say next! This is an important skill to develop when facilitating discussions, especially when you have time to fill. It is also useful when giving feedback as you can reflect back how people felt about an exercise. Never give out a hand out before you’ve been through it, trainees will look it without listening to a word you say! The rustling of paper will also distract everybody. Hold it up so it’s visible to everyone and go through what you want them to remember, then give it out. Once paper rustling has subsided ask for any questions and go over it again if necessary. A final point that I can’t stress enough is to read the manual before you start the exercise! Make sure you know what bit you’re doing and familiarise yourself with it the night before, decide between you who’s doing which exercises. This may sound obvious but I’ve trained with people so many times who haven’t done this and seem to make it up as they go along. Programmes are carefully written and rewritten to make sure everything is covered and that exercises build on each other. If you don’t know the bit you’re doing you can easily ruin something that’s coming up later by covering points during your exercise. This is the most stressful thing as a trainer, especially given the importance of not being able to tell your co-trainer they’re doing it wrong (please see above!) I make lots of notes on my copy and write questions I want to ask. I also use a highlighter to emphasis main points and sometimes write an order of points I need to remember. Make a note of questions that worked well so you can use them again, “tell me more about that” is one of my favourites for example! A nice way to end an exercise is to ask your co-trainer, “Have you got anything to add?” He/she can then add anything you’ve forgotten or make a point they want to before starting their bit. This is very respectful co-working and mirrors how you all want to work together. A sense of humour is also very important! Very serious and depressing issues are sometines discussed so a light hearted approach goes down very well when appropriate!